30 year old male, healthy-no DM, HT or other morbid factors. Sustained closed fracture both bones right leg lower 1/3rd 2 years ago. 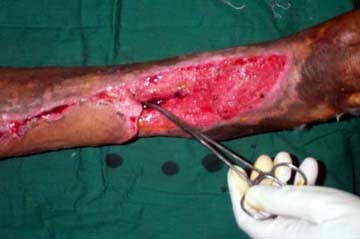 Was treated with long leg cast-developed compartment syndrome-had faciotomy. Ended up with non healing ulcer overlying the anterior part of ankle with exposed lower part of lower tibia, with osteomyelitis and thin adherent ulcerated scar over the dorsum of foot. Referred to our centre at this stage. ONLY POSTERIOR TIBIAL ARTERY INTACT. Anterior tibial artery very small, 1mm in it's proximal part. Anterior and lateral compartment muscles replaced by fibrous tissue. Procedure performed: Debridement/curettage/coverage by a tensor fascia lata fasciocutaneous flap. Flap vessels anastomosed to proximal anterior tibial artery and vein. Distal third of the flap overlying the exposed tibia and tarsal bones necrosed. Proximal 2/3rd survived. He has only one good vessel(post. tibial) in the leg. Coverage by a muscle flap would be ideal but the donor vessel problem exists? Any other options? Cross leg flap not considered because of inherent difficulties in management. (Patient is 6 feet tall and fairly heftly built).